This mantra sheet was passed down from Yogi C. M. Chen. It belongs to a class of blessing objects called "Liberation through Touch", meaning that one will gain liberation merely by wearing it. (In Nyingma lineage there are five types of "Self-Liberation without Practice," the other four are through sight, hearing, smell, and taste.) 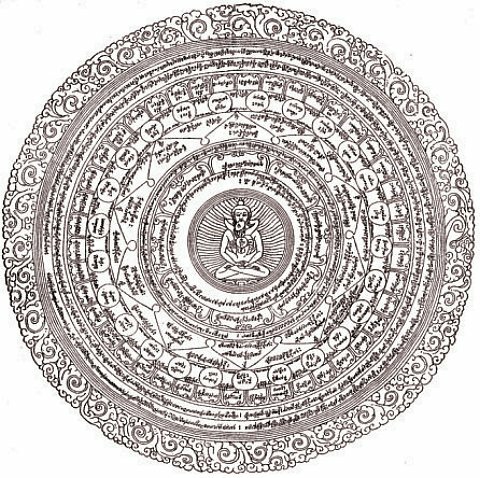 The central deity is Adi Buddha or Samantabhadra Buddha, with surrounding mantras representing the deities in the mandala, probably including all 100 peaceful and wrathful Yidams. Yogi C. M. Chen often distributed this mantra sheet freely, and those who wear it as an amulet often have inspirational experiences. In order to wear it, the sheet first needs to be folded one-third horizontally and vertically into a small square, such that the image and halo at the center is completely on the square's outside surface facing the body. For use as an amulet, one could put it in a small (preferably blue) cloth bag and hang it around the neck. Position of this amulet should not be lower than that of the heart. When one needs to have a needle injection, it is necessary to hold the amulet slightly above the body, so as to indicate that it is only the Karmic body that gets the needle. The amulet could also be hanged inside a car for protection, or the entire sheet may be framed and worshipped on the altar. One can also burn it to receive blessings. When put on a deceased body, the deceased could gain rebirth in Pureland. The image of this sheet can be printed out for use in the above ways. Do not sell this sheet for profit.